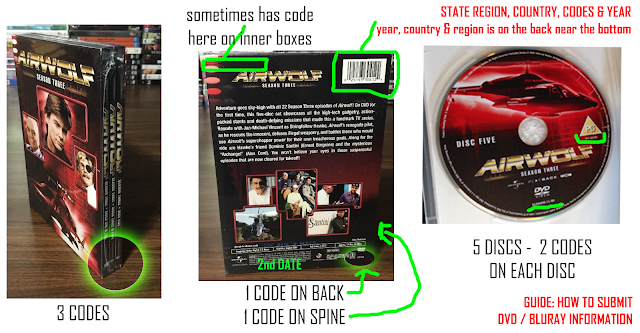 The "old" airwolf Cd Rom concept started out back in 2004 and had a random release in 2005. That is no longer compatible with newer versions of windows. 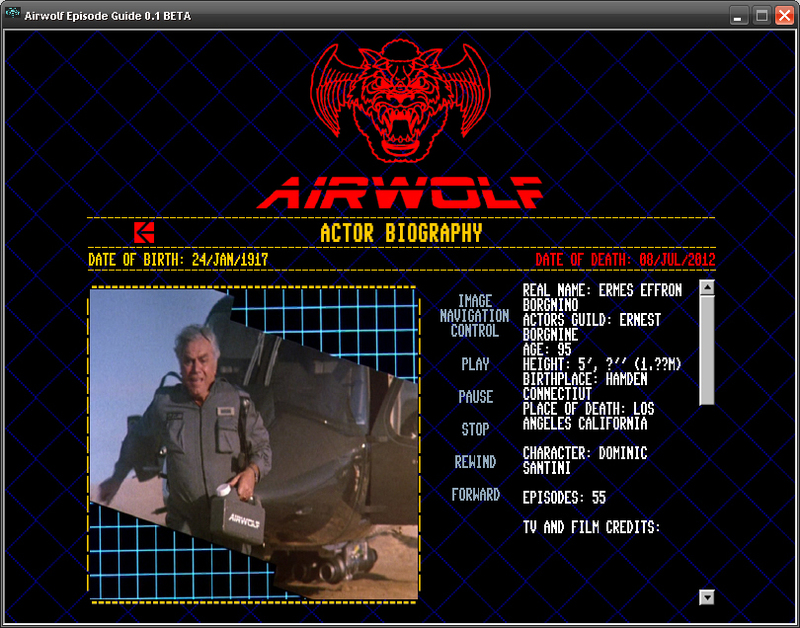 So i decided to work on some NEW smaller programs that cover some specific fields of airwolf history. Airdates, Production Codes, Cast Bio's, Trivia, Bloopers, Behind the Scenes and a host of other little features make up a great looking guide with a stack of information. 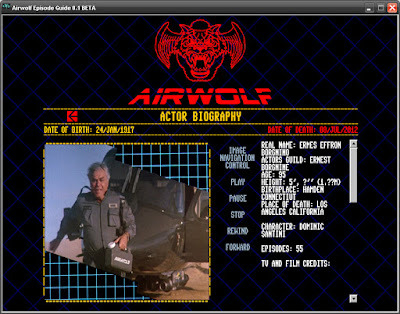 Bio screens for actors, actresses, stunt men, pilots, writers.. random crew.. 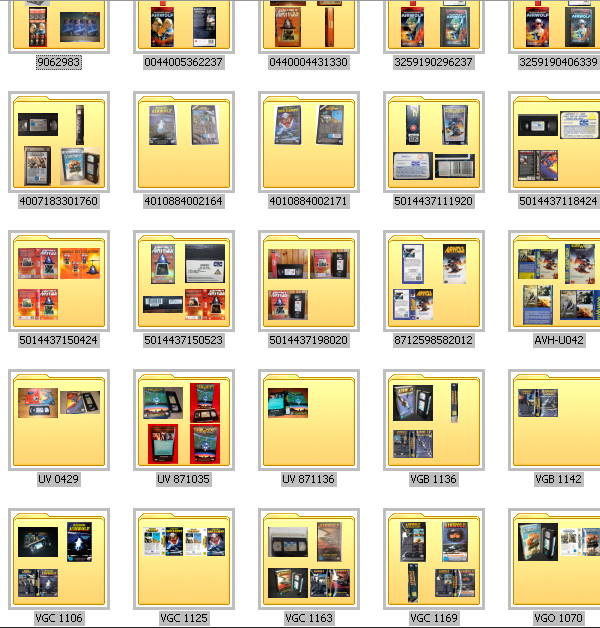 It's a big undertaking for a project like this & again highly time consuming (its a hobby for a show i love) Not something i'm essentially looking to cash in on. The licensing for retail would be retarded making its cost ridiculously high. 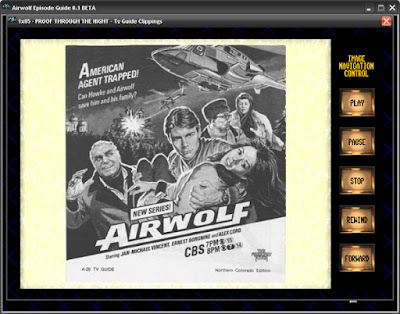 Imagine on an "Episode Screen" you could press the letter C and it opens up a box were you can view the tv guides clippings for the actual episode. 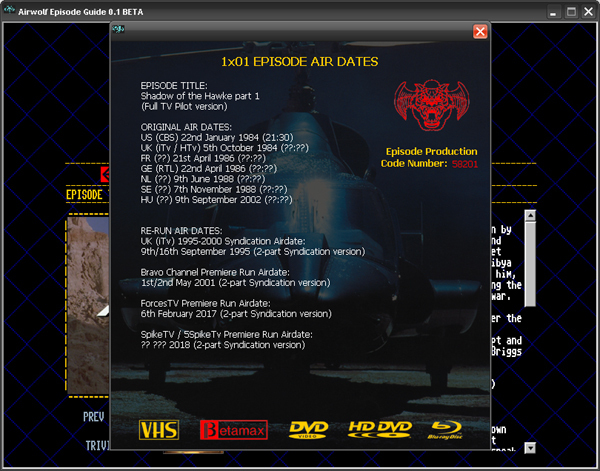 Imagine pressing C on the "Episode List" to view all clippings from that specific series of episodes. I don't no the future of this project, but i have ideas, some will work, some legally wont work.. Imagine on an episode/series "list" you could press P for promo & a screen pops up with all the promo photos from that specific series.. or press P on an episode screen for promo photos featured from that specific episode, sadly not directly legal. 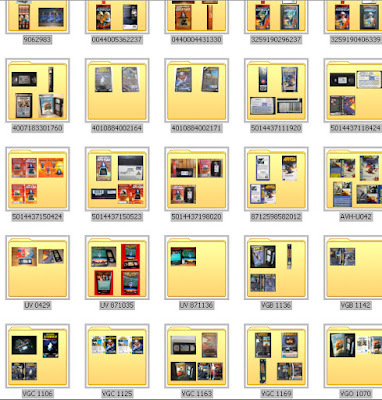 The behind the scenes aspect "is possible" but its limited to the photos available to me & the community. We have sharks, every time a crew member dies. anyone pops up with photos they disappear and so do the photos.. Seller & Buyers prerogative.. i get it.. but (me & others) have seen people offer photos freely & they've been persuaded to sell & vanish... again sadly there choice..
Game mod and addon makers can also make use of the head shots and heights, the diversity of this resource is only limited by the content and the user.. The work goes on with this project randomly, so use the update option to check for any or "follow" the post in the fb group HERE. 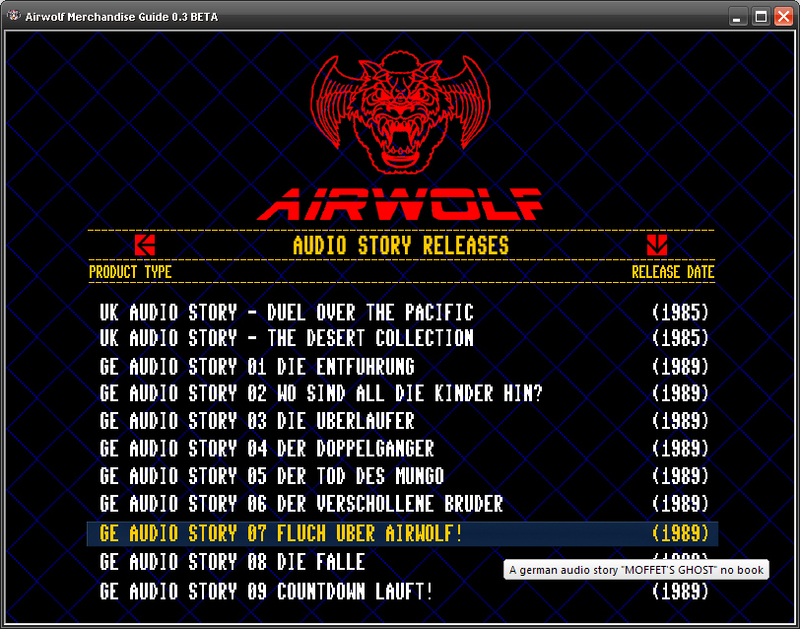 MENU HAS MOUSE SUPPORT / CHOICE OF SHORTCUT KEYS. 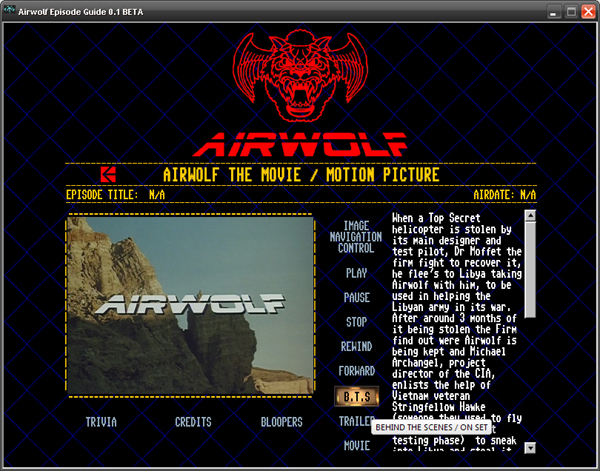 MENU HAS A COMPLEX SEARCH ENGINE POWERED BY KEY WORDS AND CODES. ACCESS SEARCH ON MOST SCREENS PRESSING S OR CLICKING THE WOLF LOGO. 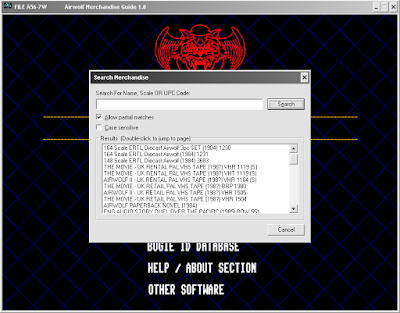 A LIST OF PREDEFINED SEARCH TERMS IS AVAILABLE. PRESSING M ON ANY SCREEN WILL RETURN YOU TO THE MAIN MENU. 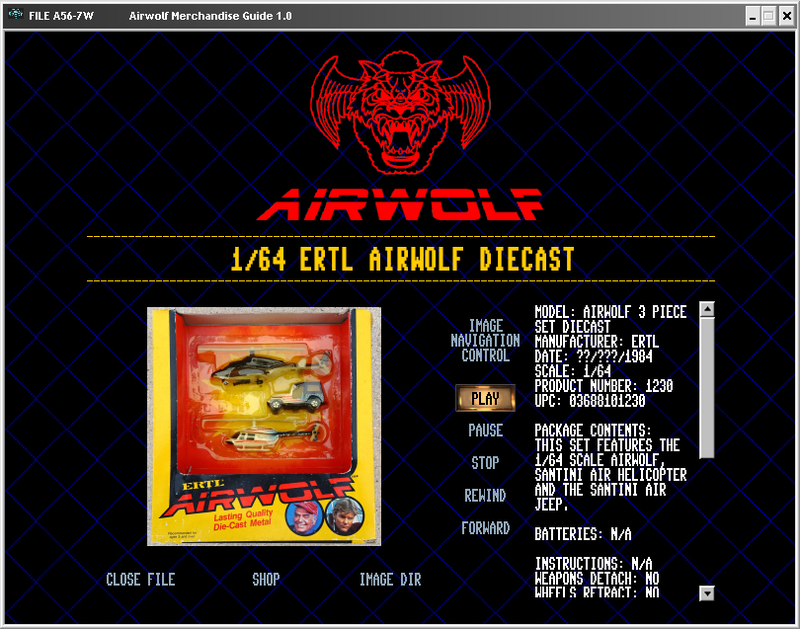 THIS MENU WAS CREATED IN 2018 AND WAS MADE FROM THE INSPIRATION OF ADAM LETTOWS REDEMPTIONS OS SCREEN SHOTS AND THE ORIGINAL AIRWOLF INTERACTIVE CD ROM FROM WAY BACK IN 2005.
mine is actually accurate and validated. Example: 08/JUL would list any deaths on that day, /JUL would list any deaths that month. 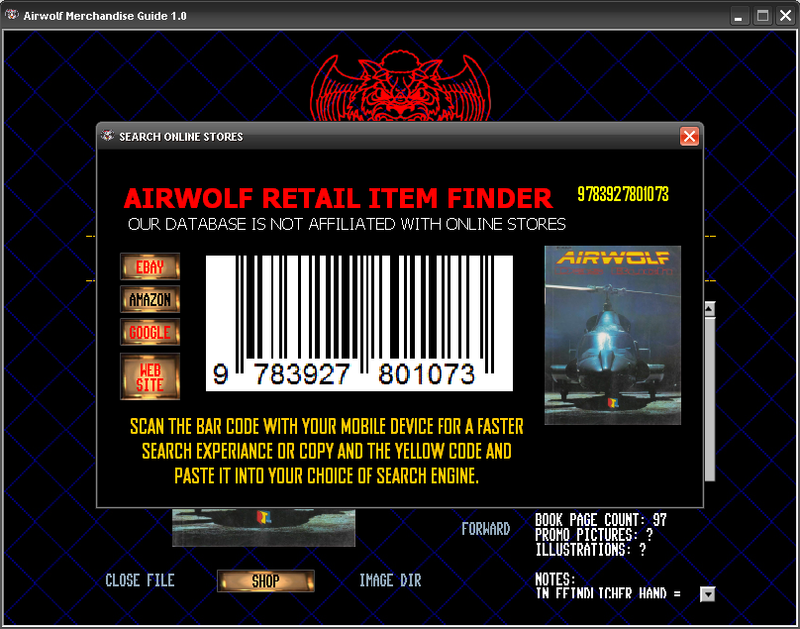 EASY TO UNDERSTAND THAT, BUT WORTH REMEMBERING THE "search result"
NOTHING ELSE REALLY.. ITS A WORK IN PROGRESS..
Just imagine for a moment an electronic database holding 100's of product numbers, upc codes, amazon codes.. direct links that'll search amazon, eBay or google for a specific product your looking to buy. 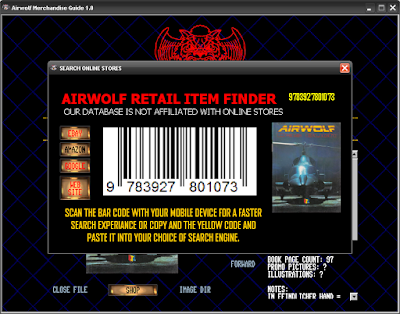 Or scan the bar code with a mobile device with a store app of your choosing, even copy and paste that yellow UPC into any online search engine you wish. We have NO plans to set a value on anything at all because that would be pompous, arrogant and frankly immoral to advise fans of an items worth. They go for what ever the reserve is going to be OR what fans are willing to bid.. NO FAN has a right to state a value to other fans, just the original street price. 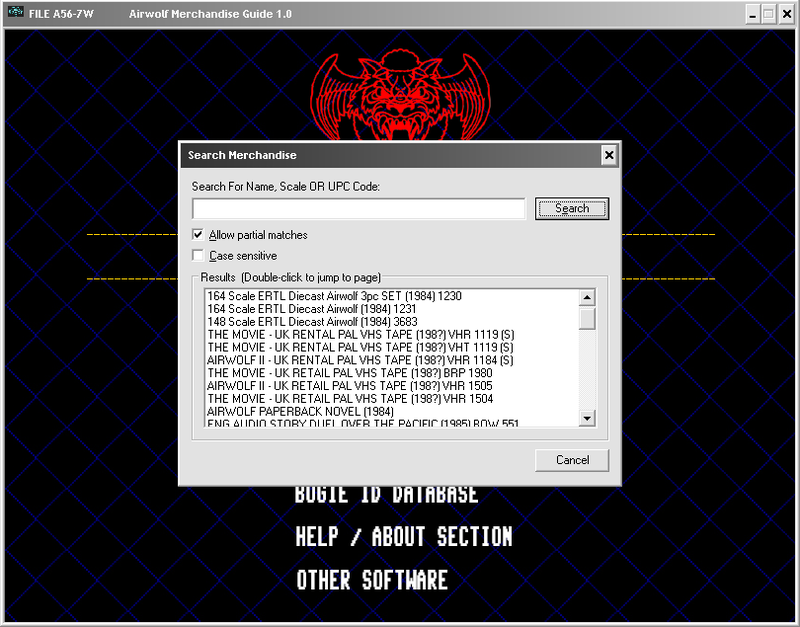 The ability to search for products or just leave that search box empty to find anything currently documented. Information on common problems encountered with the product along with any re-release info, countries of origin and much more. This project "for it to succeed" is going to involve fans input, it'll clearly need fans input. 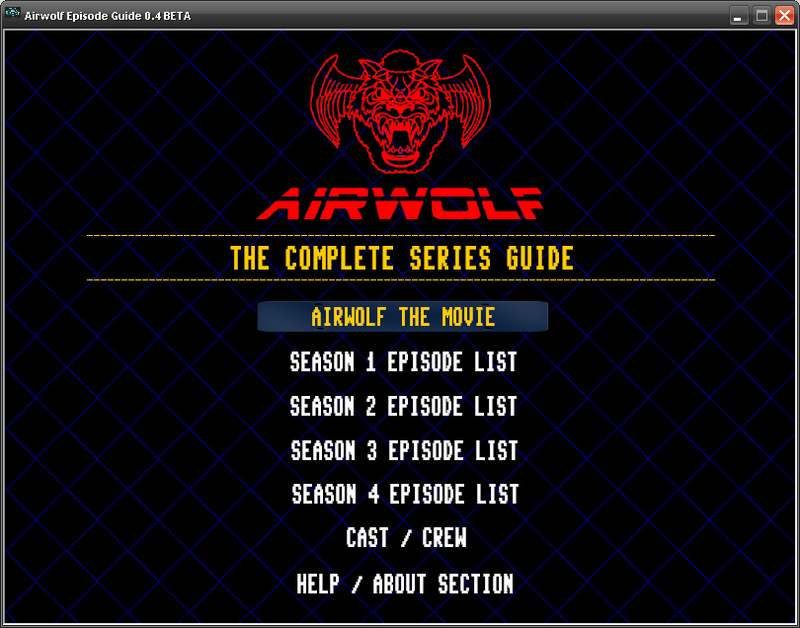 (even if i can't read it in the search box due to lacking the language pack. THE SEARCH ENGINE IS THE KEY! reply below with codes, or hit that facebook post and reply on the actual post with codes or even images..
as google dismantle G+ im unsure of the effects here (im in limbo) so the best bets the facebook post. 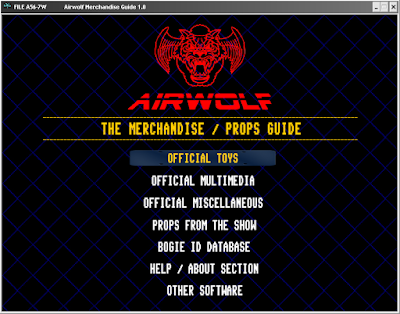 ACCESS SEARCH ON ANY SCREEN PRESSING S OR CLICKING THE WOLF LOGO. YOU CAN SEARCH THIS DATABASE FOR MANUFACTURES PRODUCT CODES, UPC, EAN, ISBN, EVEN ASIN CODES. 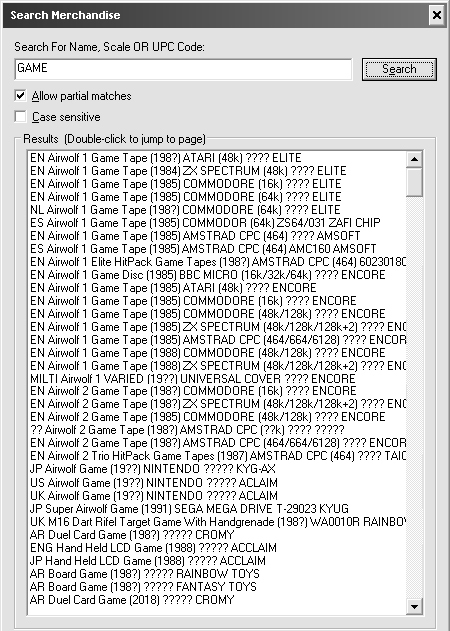 TO LIST ALL ITEMS THAT CONTAIN THOSE WORDS / TAGS. 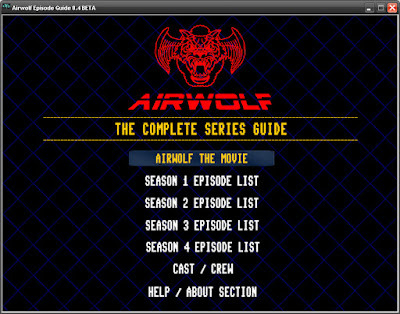 THEATRICAL = LIST'S ALL RELEASES OF THE "FILM"
From this we can define it was a uk release, it is the movie, a rental (not retail) it shows it is in the PAL video format, its a VHS Tape and we need the release date for it, then we have the Spine Code identifier of VHT 1119 (spine code is essentially the manufacture product code), Its in a Standard Video Box (rather than a rental) so (S) is small box and (L) is large box and the distributor is noted as CiC video, often mistaken for C&C. Granted we already defined rental but some rentals clearly did ship in standard retail type boxes too, as per our UK example. 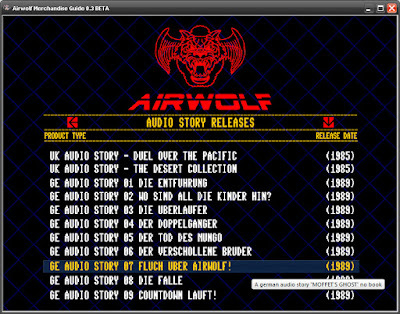 Some random episodes have been released over the years on compilation tapes and discs, as such if you search for an episode name it'll list what releases it was featured in. This whole GFX render is fake. The table, the carpet, the chairs and all the contents on the table, all faked in photoshop. Even the silver bits on the chairs are fake. 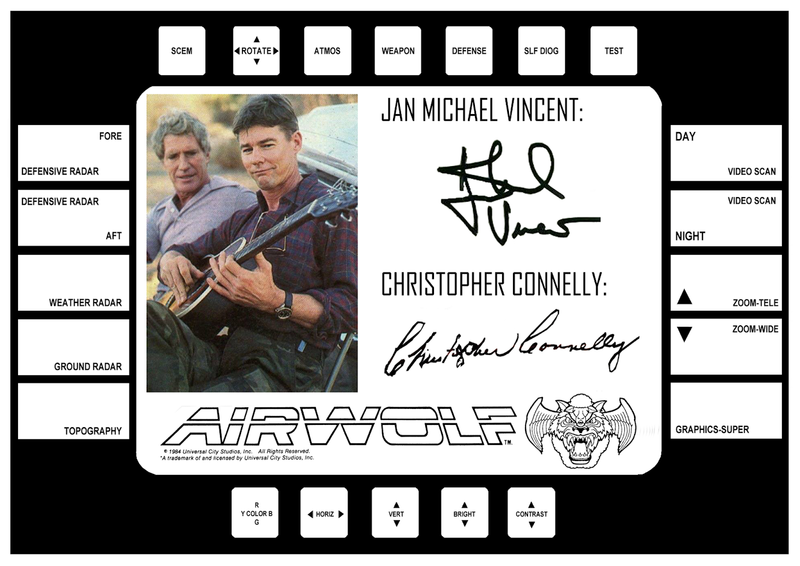 Every time i make something interesting or find something (airwolf related) i add it to the fake table. At some stage i might make the photos smaller to cram more detail into it. In turn, a copy of it could be manipulated to create a spot the difference puzzle. 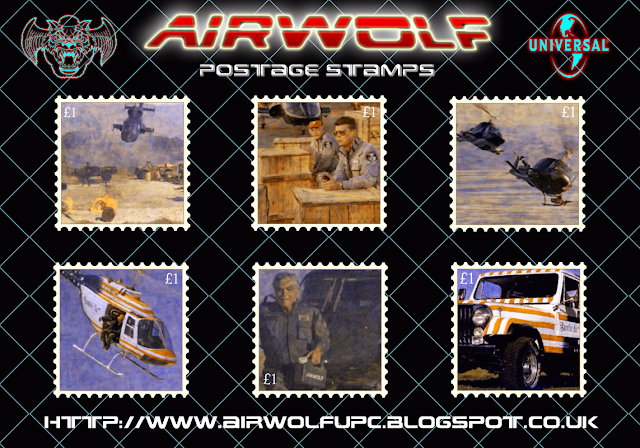 Its original origins was an A4 x2 (2 page) centre spread within a fan made graphic Airwolf / X-Files crossover comic (original here) and also (sequel here) both links point to facebook photo albums. The table depicts the information F.B.I agent Fox Mulder has gathered thus far on the airwolf project with the help of the lone gunmen. In February 1987 the F.B.I received a UFO report from a former agent, Lorrie Grant. Due to questions relating to her mental state the report was simply filed and not followed up. The incident report was later found to match a UFO report from 1984 where a fishing vessel reported the same sound flying over their fishing trawler on the night a U.S Naval destroyer sank. 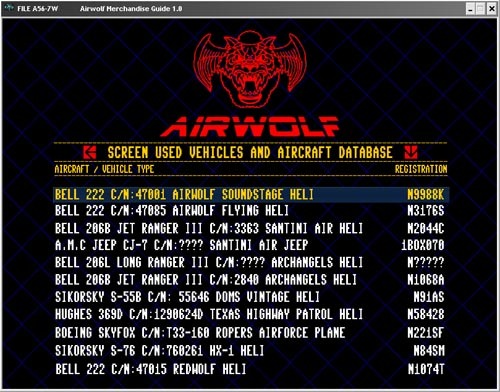 Further reports from residents in polk county texas from September 1984 also referenced an aircraft blowing over a pick-up truck and the same strange howling sounds in the air were heard.... As of NOV 1993.. Airwolf has been an active X-File.